Yes, UC workers are going on strike! That’s what AFSCME president Kathryn Lybarger told the UC regents this past Wednesday during the regents’ meeting, at which 13 workers were arrested. But don’t worry – the regents were shielded from the workers’ anger by being quickly evacuated from the meeting. Citing degradation of patient care quality due to understaffing and substandard wages, 97% of AFSCME Local 3299 members voted to authorize a two-day strike, Tuesday, May 21 to Wednesday, May 22, at all five UC hospitals. Thirteen thousand AFSCME-represented patient care technical workers will be striking for workplace justice. Another 7,000 AFSCME-represented service workers strike in sympathy. Like AFSCME, UPTE has been fighting for better patient care and against UC’s inferior two-tier pension plan, as UPTE negotiator Wendy Felson explained in this radio news story. 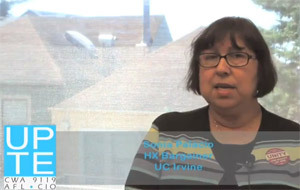 UC unions, including UPTE, AFSCME, and the California Nurses Association, contend that UC’s staff cuts and underfunding of front-line workers are short-changing patients, and that the university’s pension projections are deliberately low-balled in order to justify shifting the pension burden to employees’ shoulders, through higher contributions and degraded benefits. As one newspaper account notes, UC’s highly profitable medical center system has even been cutting front-line positions to free up funds for construction. The student newspaper at UCSD, The Guardian, published an editorial last week saying the pension cut backs "place an unfair financial burden on UC employees," and calling on students to support the strike. UC responded by going to court for a restraining order. UC succeeded in getting injunctions to block strikes by CNA nurses and AFSCME workers in 2005, 2008, and 2010. But this time, PERB refused to grant the request, dealing UC a significant setback. PERB did say, however, that it would block some critical care employees from going on strike. But since these were already staying on the job as part of the union’s “Patient Protection Task Force,” AFSCME said the practical effect of the order was minimal. That didn’t stop UC president Mark Yudof from predicting chaos and losses of $10 million if the strike went forward. UC is canceling elective surgeries for the days of the strike. Increasing numbers of professional and white collar workers are turning to unions for help with organizing, according to an article this week in the Los Angeles Times, which interviews UC Berkeley professor Harley Shaiken: “Many professionals have pricey educations and are more sensitive to unequal distributions of wealth. That's made them more willing to speak out about inequality at the workplace, said Harley Shaiken, a professor at Berkeley who specializes in labor issues."